Aberdeen is known as Europe’s oil capital, and as such is a very busy and thriving city. In a response to the challenging global financial conditions Aberdeen City Council developed an innovative approach to financial planning through the creation of a Five Year Business Plan. The aim is to achieve and maintain a balanced budget, ensuring that the money spent on providing services is no more than the money received. To assist on achieving this target officers within the Intelligent Transport Systems unit proposed to minimise the expenditure on their communication circuits currently provided by BT. Technical officer Neale Burrows proposed to replace the circuits with a private network that would provide a significant reduction on the costs to the service. The move to a private network was also encouraged by the intention indicated by BT to cease the type of circuits utilised for the traffic signal communications. Aberdeen’s Own Private Fibre in their Ducts. As Aberdeen City Council had it’s own duct infrastructure around Aberdeen, (which is utilised for CCTV), it made perfect sense to make use of these ducts by Aberdeen City Council installing their own fibre, building a private network which is not beholden to any third party organisation and thus avoiding any future operating costs. Tender for a Managed Switch Network. 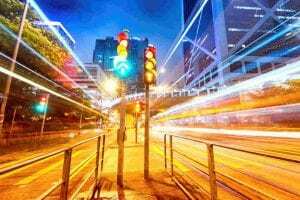 Having installed the Fibre, Aberdeen City Council issued a tender for managed Gigabit Ethernet switches, together with an SNMP multi-user network management system and commissioning services. Case Communications was one of a number of companies who replied to Aberdeen City Council’s tender and whose products matched the requirements most closely, at the most competitive prices. Case Communications provided their IGE 4T4GB-MX switches, each of which supports 4 Fibre gigabit ports, and 4 x Copper Gigabit ports and operating from -400C to +750C. The switches are equipped with SNMP management (Simple Network Management Protocol), allowing any unusual conditions to trigger an alarm message which goes back to the CaseView management system, where these alarms and traps are stored within a database. To further improve reliability, the Case Communications switches are fitted with the latest SFP (Short Form Pluggables) (Modular Fibre Optic drivers) which use the advanced DMI (Dynamic Managed Interfaces). They detect the transmit and receive levels, and the temperature at the fibre interface. In the event of any conditions being detected which are outside of ‘normal parameters’, alarms are sent to warn management of impending problems. 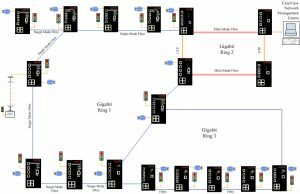 Phase One Gigabit Switch Network. The first phase of the network, (which can be seen in the diagram below), consists of 18 switches in two rings with a number of spurs feeding odd sites. Any break in the rings will self-heal within 10milli-seconds, so quick that none of the systems working on the ring will even know there has been a problem. This makes it even more important to utilise a Network Management System, to track and keep a log of problems. The network is fully equipped with QoS (Quality of Service) to allow applications such as UTMC to take priority over less important applications such as traffic monitoring CCTV cameras. Thus allowing UTMC to be the highest level of priority over any other data sources. Using analogue circuits and modems on the legacy BT network data rates of 1,200 bps to 2400bps were typical; with the new fibre network, the network is operating at 1.25Gbps, and with greater reliability. With the BT circuits that the UTMC system utilises becoming obsolete, the most suitable alternative was to install a private fibre network. If Aberdeen City Council had used third party fibre circuits typically they would have cost two to three times the cost of the old circuits and would have had considerable construction costs to install these circuits. One of the criteria for the network was to be flexible enough to support a variety of systems and not just UTMC functions. In order to achieve this Case Communications’ networks support VPN’s (Virtual Private Networks), which allows one physical network to support multiple logical networks. While all applications will make use of a common infrastructure, each application will appear to have a dedicated network and will not have access to other virtual networks. For sites which are remote from the city centre, Case Communications Industrial 6401 ADSL routers are used. These will run a secure encrypted IP Tunnel through the Internet back to the Traffic HQ. The 6401’s are fully managed by the same management system as the IGE 4T4GB MX switches allowing the same level of management and control as the switches. In November 2016 Aberdeen City Council added 15 Wi-Fi access points for the free use of the public on the network ready for a festival in December. The Public Wi-Fi was rolled out in a few days and put into a VLAN to ensure compete security between the public network and Aberdeens own UTMC and CCTV Network.